First of all, clearly I have been gone for a very long time. Hell, most of my posts before I left weren't even about the Twins. Well, I've come to make another one of my inane claims that all that is about to change. Back to Twins only here. Consistency and readability of said posts TBD. Also, if you want to see me say things I will probably regret almost immediately, follow me on Twitter. Due to this whole multiple blogs thing, I changed my Twitter name, but I'm still obnoxiously and pointlessly tweeting. Anyway, enough about me, on to some Twins thoughts. A couple of weeks ago, Seth Stohs of www.sethspeaks.net invited some bloggers to take place in a vote for some Twins awards. For reasons unbeknownst to me, he selected me as one of said bloggers. So I took part. If you haven't seen the results yet, you can check them out here. Or here. I'm not going to run through everything, because I trust in your ability to use a mouse on the links above, but I would like to offer a few of my thoughts. While I have no problem with Joe Mauer being chosen as MVP, and fluctuated between him and Delmon Young as my 1-2, I eventually settled on Svelte Delmon as my team MVP. For me, the vote came down to whose inconsistency was ultimately more beneficial to the Twins. And, while Young has been off-and-on all year, he literally carried the team during a time when nobody else was hitting. Plus I was hoping if he won, it would motivate him to "svelte up" again. As for Mauer, he was terrible in the first half. And, yes, for Joe Mauer he was terrible. Obviously he has been hitting since, and you can very easily argue he has the best overall numbers on the team, but I can't get over that first half. Color me petty. Plus, when he started picking it up offensively, Young was still raking and Thome was hitting home runs in seemingly every at bat. Svelte Delmon literally carried the team at a point in the summer when nobody else was hitting. I believe he deserves recognition for that. When it came to choosing a best pitcher, there were really only two choices: Francisco Liriano and Carl Pavano. And as much as I love Pavano's mustache, and as great as he's been, Liriano hasn't gotten nearly enough credit for being a legit ace. Which is exactly what he has been. There seems to be two schools of thought here: 1. Overreacting and 2. Overreacting to the overreacting. The games are meaningless right now, and the Twins know that. Whether they want to admit it or not they're in cruise control. 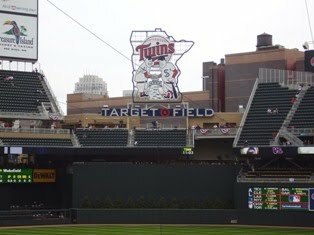 If Mauer, Thome, and Hardy don't return this weekend, and the Twins lose the first game of the playoffs 12-2, then I'm all for panicking. In fact, I'll be driving the panic train at that point, but until then, meh. Anyone else frustrated by the playoff ticket situation? I'm not a season ticket holder but I won the lottery and didn't end up with tickets because I got bounced around on the Twins website. There has to be a better system. At the very least, once you are out of the "virtual waiting room" and onto the actual ticket purchasing screen, you should be able to get tickets. Frustrating. Lastly, I am considering switching to Wordpress and while I am generally incompetent as a person, I am even more incompetent when it comes to computers. Anyone have any helpful thoughts about this?